After receiving some input from the Flyfisher’s Paradise fly shop (www.flyfishersparadise.com), Tim Brookens, my son Craig and I decided to make a trip to Spring Creek. The input was that BWOs were coming off and fish were rising. After breakfast at Topp’s Diner in Huntington, PA, we arrived around 10:00 am. No fish rising until around noon and they were sporadic due to the wind. Stream temperature was 40 degrees. Needless to say the wind made the fishing very challenging. Tim caught a few trout on nymphs but Craig and I stubbornly stuck with dries with less success. Craig did catch a nice 15″ Brown on a flying ant after many refusals of an Olive. We also each stung a fish or 2. I did land one fish on a #24 gray hackle fly and spent an hour getting totally frustrated on an active riser. I could not solve getting a drag free drift in the wind. Although not highly successful, it was great breaking the ice. Trout season has arrived! 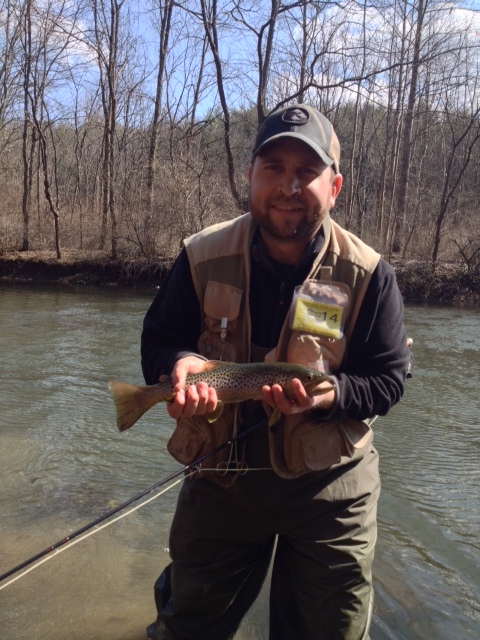 This entry was posted in Uncategorized and tagged Craig's 15" Brown. Took, though I am not a fly fisherman, reading trough your posts was a nostalgic and good read. It is also very inspiring. Good to see you guys still getting out and enjoying the great outdoors. Dad and I are getting excited for Spring Gobbler Season. It’s almost time for some extensive hiking too. Hope all is well. Feel free to contact me some time. Great to hear from you. Good luck in turkey season. Say Hi to your Dad and Mom. Will do. Please say hello to everyone for me as well.